In my previous post on bitcoin mining using Mac OS X, I discussed what is in my opinion the easiest way to get your toes wet with mining: BitMinter. BitMinter is a great bitcoin mining pool and its Java based miner makes it very simple to try out bitcoin mining on Mac OS X using your graphics card to calculate hashes. 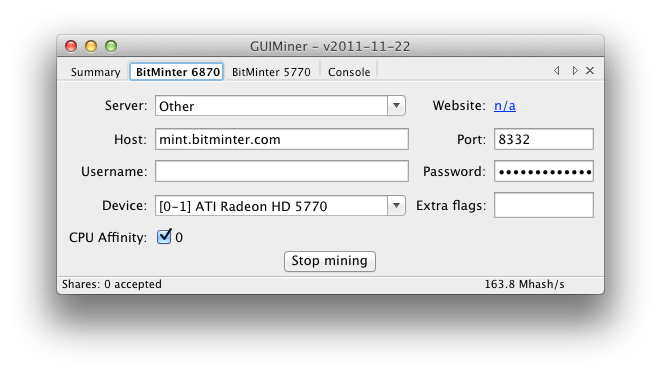 In terms of ease-of-use, the next bitcoin miner for OS X I’ll discuss is GUIMiner. 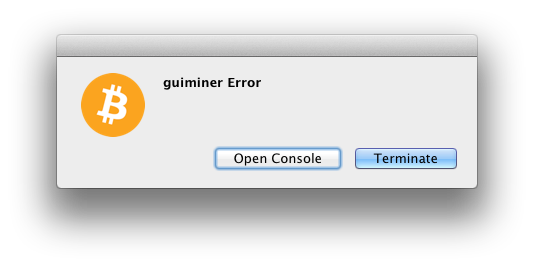 GUIMiner is also available for Windows and, unfortunately, it’s much easier to find recent binaries for Windows than for OS X. You can download the official OS X release of GUIMiner here. However, this release is a year or so old at the time of this post. You may be able to find more recent releases here, but you’d be trusting unofficial code on your system. After you download the disk image (dmg) file, make sure you move the guiminer.app file to a writable location. Attempting to launch it from the dmg file directly will result in GUIMiner crashing. Once you launch GUIMiner, setup is straight-forward. You can click File>New to create a new tab for a miner. Only the OpenCL miner is supported out-of-the-box. After creating a new OpenCL miner tab, you can select a server (mining pool) from the drop down or select Other and enter the host, port, username and password manually. Select your device (graphics card) and finally click the Start mining! button. If you have multiple graphics cards, you can add additional miners from the File>New menu or, if you plan on using the same mining pool, right-click your existing miner tab and click Duplicate. Click View>Summary to get an overview and controls for each graphics card. As you can see there is a noticeable performance improvement using GUIMiner and the poclbm kernel instead of BitMinter. 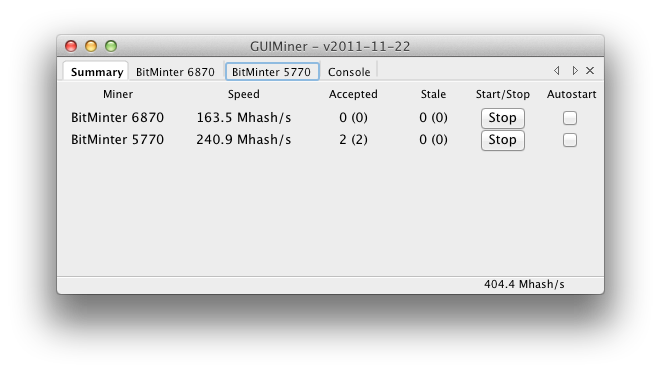 With my own hardware I get a boost of about 30 Mh/s using GUIMiner instead of the BitMinter client. In the final post in this series I’ll discuss these last two miners: cgminer and bfgminer. These miners give the best performance that I’ve found. However, you’ll need to compile them yourself in order to use them, which isn’t a simple feat. There’s also some manual patching of C code required if you are running multiple graphics cards on OS X. Stay tuned! This entry was posted in CryptoCurrency, Technology on April 23, 2013 by Nathanial Woolls (Nate). Hi, question: I’m mining on Slush’s Pool and due to admin rights I am currently stuck with mining on the older Getwork protocol; this gets turned off when Stratum users are at 99% (its at 98% now!). Do you have any suggestions to getting a non-admin app with Stratum support for Mac? I can’t be the only one in this situation! Hi, thanks for the article. Which mining pools do you suggest us to use? I’ve downloaded the GUIminer dmg file, but can’t seem to find out where to relocate it. Where would a writable location be? Create a folder on your desktop. Put the GUIminer file in it. Voila! Hi, how can I use a red fury with GUIminer on Mac? Thanks! Do you know of any mining proxys for Mavericks? The newest i can find are for Mountain Lion. I would use BFGMiner. It works great on OS X and includes both a Getwork and Stratum proxy. I followed the tutorial and installed GUIminer on my new MacPro (Running Mavericks). Connected to Slush’s pool and started mining, however whereas (using the same credentials) on my PC the shares are being accepted, on the Mac nothing happens. Looking at the console all the shares are being rejected. I would greatly appreciate anyone’s help, as I’ve been googling this for hours with no luck.